Chicago, Illinois – To mark Via Campesina’s International Day of Peasant Struggle, family farmers and their allies will converge at the Chicago Mercantile Exchange (CME) – 141 W. Jackson – at noon on Friday April 18, 2014 to expose the rampant price fixing by commodity speculators that drives the ongoing global food and climate crisis. 12:00pm – Protest and Leaflet, Chicago Mercantile Exchange, 141 W. Jackson Blvd. 5:30pm – Potluck and Discussion, Institute of Cultural Affairs, 4750 N. Sheridan Rd. Family Farm Defenders’ annual protest at the CME demands greater social responsibility and transparency from one of Chicago’s most lucrative and secretive corporations, which posts billions of dollars in profits while rural workers and family farmers live in poverty. 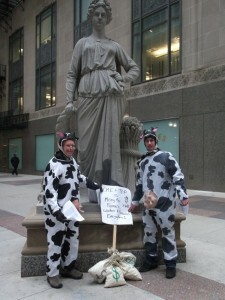 Dairy farmers in particular will call upon the Department of Justice (DoJ) to take action against the food giants – including Dairy Farmers of America (DFA) Land O’Lakes, and Dean Foods, which control close to half of all milk production in the country – that defy anti-trust laws and remain silent on price fixing at the expense of working farmer families. Marches and rallies are held around the world on Via Campesina’s International Day of Peasant Struggle every year to draw attention to economic, political, and cultural exploitation suffered by rural people and communities. It commemorates the massacre of 19 unarmed farm workers who were demanding agrarian reform in Brazil in 1996. The same evening at 5:30 pm there will be a potluck and community forum on food sovereignty and climate justice at the Institute of Cultural Affairs (ICA) – 4750 N. Sheridan in Chicago. Featured panelists will include: Joel Greeno, WI farmer and president of Family Farm Defenders, Jed Schenkier of Loud Grade Produce and 2014 winner of the John Kinsman Beginning Farmer Food Sovereignty Prize, Seva Gandhi of the ICA’s Accelerate 77 which creates collaborative spaces for organizations of work on sustainability, Debar Michaud, organizer wit Tarsands Free Midwest, as well as invited speakers from Food and Water Watch (FWW), Chicago Fair Food, and the Landless Workers Movement (MST) of Brazil. Further information about the questionable activities of the CME and how these contribute to global climate change and the ongoing dairy crisis can be found below. Despite massive public hearings across the U.S. and dozens of pending legal complaints, the U.S. Dept. of Justice (DoJ) and the Commodity Futures Trading Commission (CFTC) have yet to take serious anti-trust action against the corporations and their traders that routinely manipulate CME markets for their private profit. These bad actors include some of the world’s largest food giants and even corrupt farmer co-ops. In 2008 the CFTC found Dairy Farmers of America (DFA) guilty of price rigging at the CME and levied an unprecedented $12 million fine. In 2103 DFA paid a $158 million to settle another lawsuit that it conspired with Dean Foods to fix milk prices to the detriment of dairy farmers across 14 states. Implicated in similar dairy price shenanigans are Kraft Foods, Schreiber Foods, and Land O Lakes. From its humble beginning in 1898 as the non-profit Chicago Butter and Egg Board, the CME has since grown into the world’s largest private trading clearinghouse. Each day an elite group of commodity traders gathers at the CME to swap such products as natural gas, soybeans, cheddar cheese, fertilizer, and feather meal (ground up dead chickens and chicken manure used to feed livestock). Within seconds this “thin” market reverberates around the globe, affecting farmgate prices and grocery bills for billions of people. In 2002 the CME began issuing its own stock, and in 2007 acquired the Chicago Board of Trade (CBOT) for $8 billion as one of its designated contract markets (DCMs). In 2008 the CME Group bought out another rival, the New York Mercantile Exchange (NYMEX) for $8.9 billion, and in 2009 also acquired the Dow Jones Indexes. In 2010 the CME reported revenues in excess of $3 billion, handling over 12 million contracts per day. While some human shouting still occurs in the pit, over 70% of CME trading now happens quietly behind the scenes through its Globex electronic platform. The majority of CME trading is now also done by speculators, who have no tangible interest in the commodities being traded. CME remains the most profitable business in Chicago, yet it receives millions in tax breaks each year from the State of Illinois in order to keep it from moving elsewhere. CME executives are also routinely ranked among the wealthiest people in the U.S. Outgoing CEO Craig Donohue received over $6 million in 2012, though he only worked for the CME for four months. His successor, Phupinder Gill, received compensation of $3.3 million for the remainder of the year. For years the CME was also home to the Chicago Climate Exchange (CCX), North America’s largest pollution market. At its height, the CCX had over 450 traders including the Farm Bureau, Dupont, Ford, and the University of California. But in 2010 the market eventually succumbed to an over supply of “hot air” credits that drove down the price of carbon from a high of $7.50 per metric ton to less than 5 cents. The CME has since moved on to acquire GreenX as its latest global pollution market – with an estimated 450,000 contracts traded in 2011, equivalent to 450 million tons of CO2. These carbon traders include some of the top names in tar sands, land grabbing, and fossil fuels: ABN AMRO, British Petroleum, Goldman Sachs, and Wells Fargo to name a few. This entry was posted in Blog and tagged Chicago Mercantile Exchange, Climate Change, Commodification, Consolidation, Dairy, Fair Prices, Food Crisis, Food Justice, Food Security, Food Sovereignty, La Via Campesina, Land Grabs, Land O'Lakes, Local Food, USDOJ. Bookmark the permalink.